NEW YORK/SEOUL: North Korea’s foreign minister said on Monday President Donald Trump had declared war on North Korea and that Pyongyang reserved the right to take countermeasures, including shooting down US bombers even if they are not in its air space. Ri Yong Ho said a Twitter message by Trump on Saturday, in which the president warned that the minister and North Korean leader Kim Jong Un “won’t be around much longer” if they acted on their threats, amounted to a declaration of war. “Since the United States declared war on our country, we will have every right to make countermeasures, including the right to shoot down United States strategic bombers even when they are not inside the airspace border of our country. “The question of who won’t be around much longer will be answered then,” Ri added. On Saturday, US Air Force B-1B Lancer bombers escorted by fighters flew east of North Korea in a show of force after a heated exchange of rhetoric between Trump and Kim over North Korea’s nuclear and missile programs. “That operation was conducted in international airspace, over international waters, so we have the right to fly, sail and operate where legally permissible around the globe,” Pentagon spokesman Col. Robert Manning said on Monday. North Korea, which has remained technically at war with the United States since the 1950-53 Korean War ended in a truce and not a peace treaty, has been working to develop nuclear-tipped missiles capable of hitting the US mainland and conducted its sixth and largest nuclear test this month. Pyongyang, which has pursued its missile and nuclear programs in defiance of international sanctions, accuses the United States of planning to invade and regularly threatens to destroy it and its Asian allies. However, recent rhetoric from both sides has been unusually harsh, raising fears of miscalculation that could have massive repercussions, even though US officials have repeatedly stressed the administration prefers a negotiated solution. The latest round of heavy verbal salvoes began when Trump threatened in his maiden UN address last Tuesday to “totally destroy” North Korea, a country of 26 million people, if it threatened the United States or its allies. In an unprecedented direct statement on Friday, Kim called Trump a “mentally deranged US dotard” he would tame with fire. Ri told the UN General Assembly on Saturday targeting the US mainland with its rockets was inevitable after “Mr Evil President” Trump called Kim a “rocket man” on a suicide mission. On Monday, White House National Security Adviser H.R. McMaster defended Trump’s rhetoric, saying he agreed with the US president that the risk was that Kim Jong Un might fail to realize the danger he and his country were facing. McMaster voiced confidence that the United States could, for example, impose a military blockade if it chose, perhaps even as a part of a multinational effort. But he acknowledged risks of escalation with any US military option. “We don’t think there’s an easy military solution to this problem. There’s not a precision strike that solves the problem. There’s not a military blockade that can solve the problem,” he said, adding that ultimately it would come down to an international effort. Still, McMaster told a conference hosted by the Institute for the Study of War, Washington was concerned a nuclear-armed North Korea capable of hitting the United States was likely to engage in “nuclear blackmail,” for instance to try to achieve its goal of getting US troops off the Korean peninsula. “There cannot be another outbreak of war on the Korean peninsula; the consequences would be devastating,” she told Washington’s Center for Strategic and International Studies. Former US Secretary of State Madeleine Albright, the most senior serving US official ever to visit Pyongyang, said it was “important to lower the temperature” of rhetoric. “I’m kind of concerned about accidents of some kind that might happen,” she said. United Nations Secretary-General Antonio Guterres said the only solution to the crisis was a political one. “Fiery talk can lead to fatal misunderstandings,” UN spokesman Stephane Dujarric told reporters. China, North Korea’s neighbor and main ally, which has nevertheless backed UN sanctions over Pyongyang’s nuclear program, called for restraint on all sides. “We want things to calm down. It’s getting too dangerous and it’s in nobody’s interest,” China’s UN Ambassador Liu Jieyi told Reuters. China’s said it was vital that everyone implement all North Korea-related UN resolutions, which call for both tighter sanctions and efforts to resume dialogue. Chinese President Xi Jinping, speaking to British Prime Minister Theresa May by telephone, said he hoped Britain could play a constructive role in achieving a peaceful solution via talks, Chinese state media said. Defense experts said North Korea would have difficulty shooting down a US bomber with missiles or fighter planes given its limited capabilities, and if it tried and failed, would appear weak. 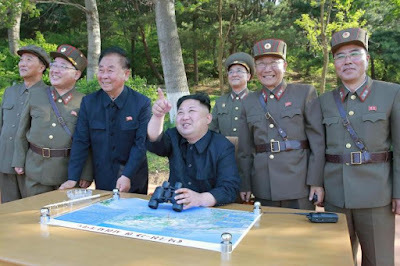 Ri warned on Friday North Korea might test a hydrogen bomb over the Pacific Ocean, in what would be North Korea’s first atmospheric nuclear test. Experts said such a move, while perhaps not imminent, would be proof of North Korea’s ability to successfully deliver a nuclear warhead on a missile.